Tropkl. Razz bri. B current. I might not buy it because of the naming, but I would smile as I passed by. Right up there with iSnack2.0 for opportunistic, short-sighted fad marketing. It will do well. But “99% fizzy fruit juice”? What does that mean? I’m not convinced it’s 99% fruit juice, that’s for sure. 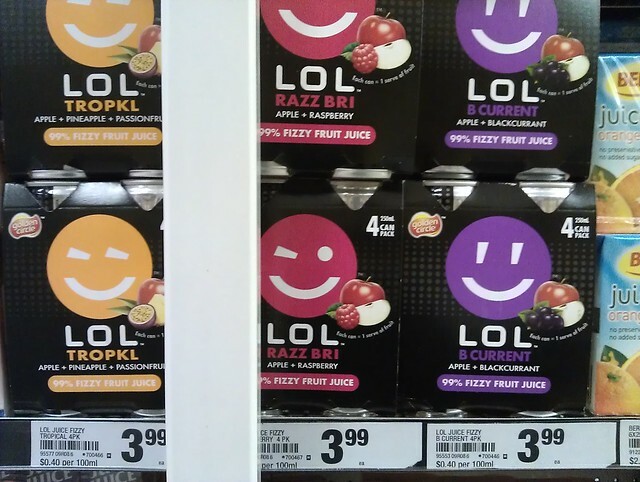 They are indeed 99% fruit juice, carbonated. I think the remaining 1% is added Vitamin C or something. I’ve always found the names “B CURRENT” etc. quite amusing, because the most prevalent ingredient in all of them is apple juice. Seems that they’re dodging some sort of legal problem by not writing “BLACKCURRANT” etc. unambiguously.